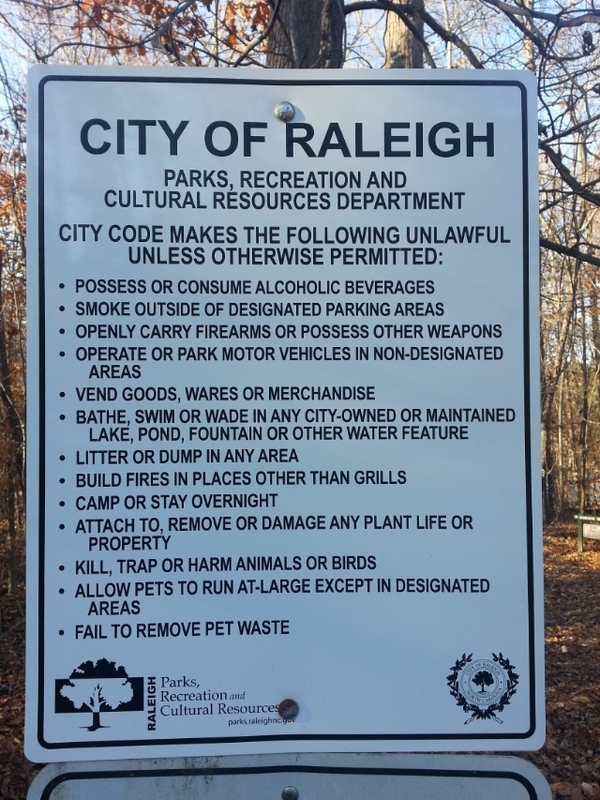 Maybe I’m a little late to the party, because I’ve admittedly been absent from any Raleigh city parks for a while, but the last time I was out at Durant Nature Park the park rules signs just had duct tape on the old signs covering the part about concealed weapons. If I remember correctly (typing this on my phone otherwise I’d look it up) we gained park carry with the passage of House Bill 650 into law, somewhere around the end of 2012, so it’s nice to see that the signs are finally being updated to reflect the law. Concealed carry only, yeah quite a win you got there. Sort of like allowing black people or women as long as they cover up right? Otherwise your rights are ok as long as you’re not seen. I don’t disagree, but being able to carry is better than not being able to carry at all. Getting the NCGA to pass park carry one year, then strengthen it the next year is momentum in the right direction.